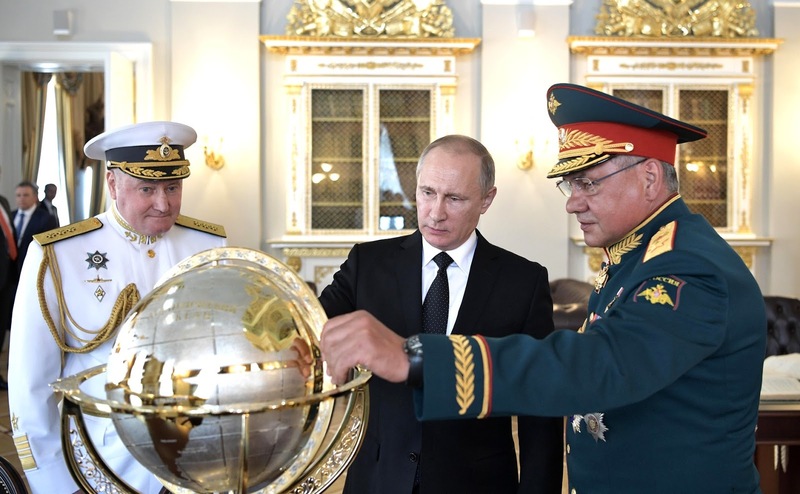 Vladimir Putin visited the Admiralty building. Putin.BLOG Armed Forces Vladimir Putin visited the Admiralty building. A reception to mark Russian Navy Day was hosted at the restored Admiralty building, which houses the Russian Navy Headquarters. Vladimir Putin visited Admiralty building. 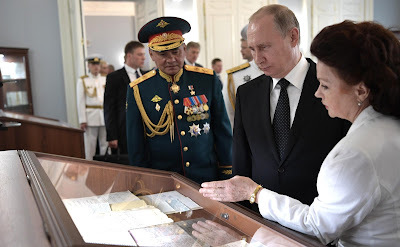 The Supreme Commander-in-Chief of the Russian Armed Forces, accompanied by Defence Minister Sergei Shoigu and Commander-in-Chief of the Russian Navy Admiral Vladimir Korolev, toured the library premises and viewed its unique Russian naval history documents, including those from the Peter the Great era. In the Admiralty building, the President also viewed an exhibition of the Central Naval Museum. The restoration of the Admiralty building began in 2013, with repairs being made on the facades and the roof, and reinforcements done to the tower and the building’s foundation. At the end of 2013, the Church of Saint Spyridon, Bishop of Trimythous, was opened in the tower with the steeple at the intersection of Admiralty Embankment and Dvortsovy Proezd. 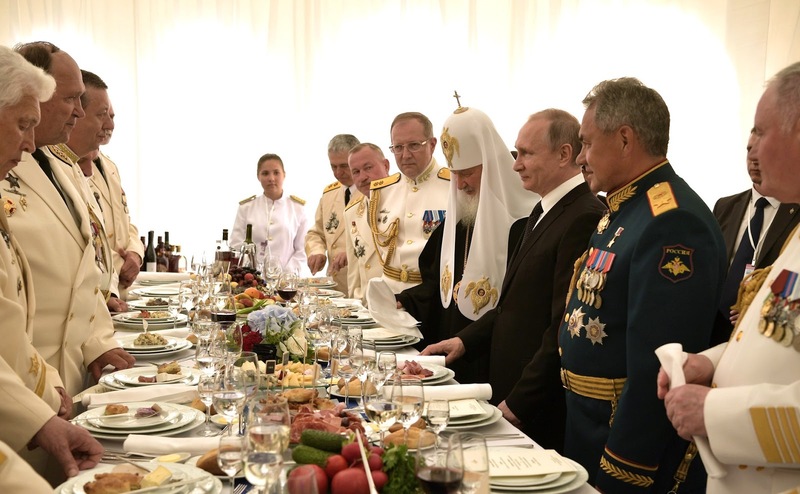 Following the visit to the Admiralty, the President attended a reception to mark Russian Navy Day. 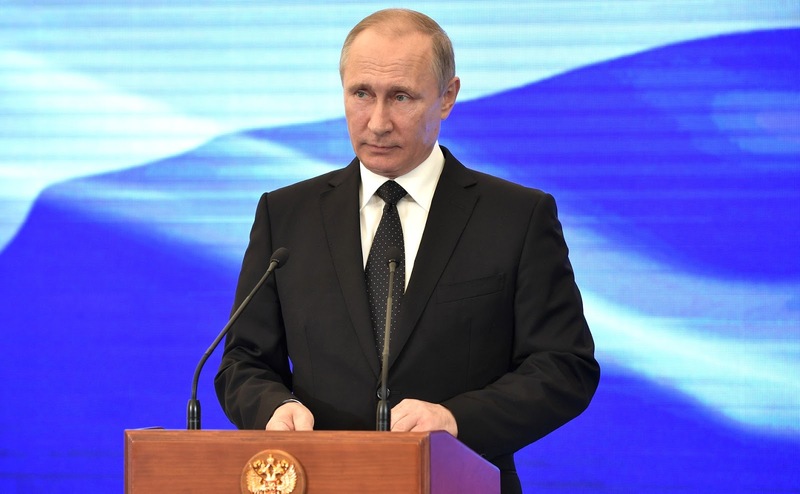 Speech at the reception to mark Russian Navy Day (Vladimir Putin). Vladimir Putin. Speech at the reception to mark Russian Navy Day. Once again, my heartfelt congratulations to you on this holiday! Navy Day is among the most popular holidays with the Russian people, who have hold in high regard people in naval uniforms, their nobility and heroism, and their professional traditions. Today, we honor courageous, strong-spirited people. You have chosen to serve in the navy, protect the interests of our Motherland and provide security of its citizens, while making a great contribution to the strengthening of Russia's defense capacity and global stature. My most heartfelt congratulations to the veterans of the Great Patriotic War. You fought to bring victory on board military ships, on land, and as part of combined naval units, marine infantry units. You have always been an example of perseverance and bravery. Vladimir Putin visited the historical building of the Admiralty. My special words of gratitude go to workers, engineers and designers. Shipbuilders’ Day, a holiday that was established this year, is the result of the well-deserved appreciation people have for the work of the many generations of people who have given life to ships and continue to do so. Today, thanks to the potential of the country's industry and science, we are strengthening the national defense and replenishing our Navy with state-of-the-art vessels and equipment. Last year, the fleet received 24 surface ships, two general-purpose submarines, and a service ship. This year, we plan to commission 30 ships and vessels. We will strictly follow our other plans for the Navy's development to boost our arsenal of modern weapons and raise the quality of combat training. And, of course, we will provide all necessary social support and assistance to servicemen and their families. Vladimir Putin. Reception to mark Russian Navy Day. We are rightfully proud of our legendary naval commanders, brave and bold officers and mariners, fearless pioneers of Arctic travels and the world’s oceans, we are proud of today's generation of Russian Navy mariners, of all those who consider fidelity to duty and the oath to serve, honor and responsibility, and the spirit of military brotherhood as being of the utmost importance. Here is to Russian Navy and the prosperity of our dear Motherland! 0 Comment to "Vladimir Putin visited the Admiralty building."